The BBC has introduced ‘last chance’ mobile notifications for its iPlayer catch-up service, notifying users when they only have a few days left to watch downloaded content. 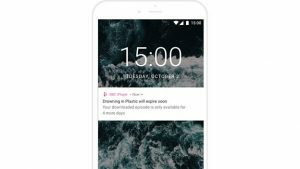 The BBC lets iPlayer users download content to watch on the move, but that content is only accessible for the same amount of time that it is hosted on the iPlayer website or app – often for 30 days after its original TV broadcast. “Downloads are a great way to watch on the move, when commuting, or while you’re abroad, but it can be very frustrating if you forget that a download is about to expire and only realise once it’s too late,” said head of BBC iPlayer, Dan Taylor-Watt.